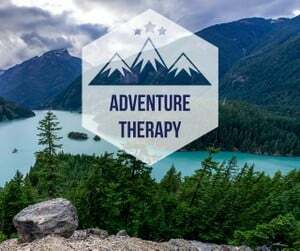 At first glance, the term “adventure therapy” looks like it contains two words that don’t belong together. The first half of the term conjures up images of climbing rock walls, shooting down whitewater rapids, and otherwise engaging in high-adrenaline pursuits. The second half prompts thoughts of quiet rooms, soft chairs, and serious discussions. But as is often the case, first glances can be deceiving. When adventure and therapy are united under the guidance of experienced professionals at reputable treatment programs, these unlikely partners can yield impressive results. Adventure therapy has proved to be particularly effective for individuals who are struggling with addiction or certain mental health disorders, but who have not had success via more traditional forms of treatment. Adventure therapy is actually a type of experiential therapy. In addition to adventure therapy, this larger category includes therapeutic journaling, expressive arts therapy, music therapy, psychodrama, equine therapy, massage therapy, recreation therapy, and others. As its name suggests, adventure therapy does indeed add a therapeutic component to action-oriented experiences. Fishing trips, canoeing, rock-climbing, hiking, and ropes courses are examples of activities that are typically offered at programs that provide adventure therapy. Of course, the activities are just one part of a successful adventure therapy experience. Before, during, and after the activities, adventure therapy participants work with professionals to identify and address issues that are relevant to their struggles with addiction or mental illness. Adventure therapy allows participants to have fun in a supportive, substance-free environment. For people who have previously been spending significant amounts of time seeking, using, or recovering from alcohol and other drugs, developing healthier leisure pursuits is an important achievement. But the benefits of adventure therapy are by no means limited to the adventures themselves. While they are participating in adventure therapy, men and women have the opportunity to develop skills that can be essential to their continued recovery. For example, various types of adventure therapy may challenge participants to confront their fears, develop a greater capacity to trust, accept responsibility for their actions, and collaborate with others in pursuit of a common goal. In a more traditional therapeutic setting, such as a process group, participants may talk about the importance of concepts such as cooperation, accountability, and communication. During an adventure therapy outing – for example, while attempting to complete a ropes course or successfully maneuver a raft through rough waters – they will put these and other skills to use. Afterward, they’ll have the chance to review their thoughts and actions. They’ll address what they did well and what they could have done better. Perhaps more importantly, they’ll discuss how to take what they learned in the woods or on the water and apply it to their personal recovery journey. Every step of the way, participants benefit from the guidance and supervision of professionals who have specific expertise with this dynamic form of treatment. Adventure therapy also promotes mindfulness, or the ability to focus on the present moment. People who incorporate mindfulness into their everyday lives report decreased stress, elevated mood, fewer symptoms of depression and anxiety, and a host of other positive outcomes. Ultimately, adventure therapy can prepare participants for the greatest, most rewarding adventure of all: living a healthier and more satisfying life. For the next 10 seconds, try not to think of a pink elephant…Impossible, right?! The fact is, the more you try to suppress an impulse to use drugs or alcohol the more fixated your mind becomes on that very impulse, and this is bad news for anyone serious about maintaining their sobriety. Fortunately, you don’t have to drink or use and you don’t have to fight or suppress your cravings, all you have to do is surf over them and they’ll disappear – using a proven mindfulness technique known as urge surfing. As difficult as it is to love someone in the spiral of addiction, adjusting to life with a person in recovery is no small task either. Many of us found we lost ourselves while loving an addict/alcoholic. Now we start our own journey - one in which we focus on self. Alcoholics and addicts do things in active addiction which leave them feeling guilt and shame. Learn what you can do to get over your guilt and shame to forgive yourself and let go of the past.